There are two ways to adjust an invoice. 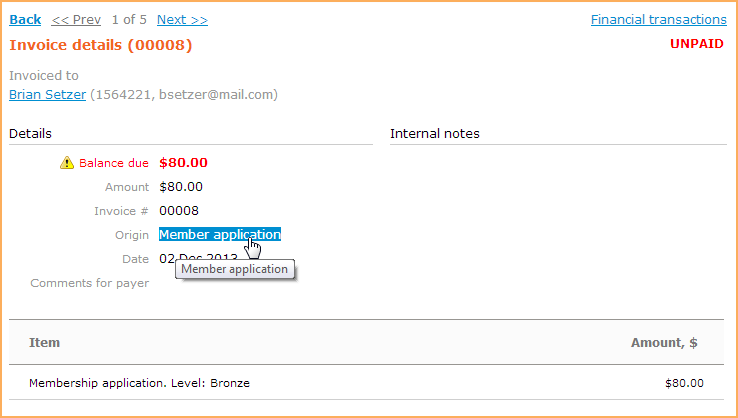 You can edit the invoice directly or edit the original transaction then adjust the updated invoice. Directly editing the invoice is advised only for manual invoices but not for automatically generated invoices because this will lead to discrepancies between the original transaction and its invoice. If you want to remove an erroneous transaction, the recommended approach is to go to the transaction in question (e.g. event registration) and delete or cancel the transaction. If you want to reduce the invoice amount because of a special discount, the recommended way is to create a special tender and record a payment using that tender. If you want to cancel an invoice, you can void it, thereby preserving historical information for any future audits. After voiding an invoice, you can delete it if you don't want to preserve a record of the invoice. You can update an invoice by adjusting the original transaction. Find and open the invoice. Click the Origin link to display the transaction. From here, click the Edit button to enter edit mode. Now you can change the information that was entered. 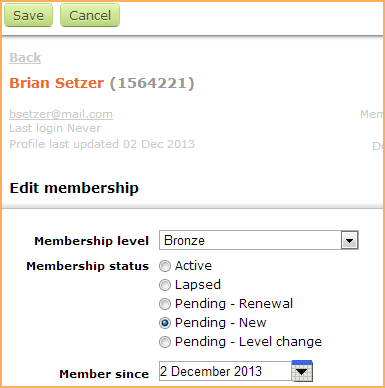 For example, if it is a member application, you can change the membership level. 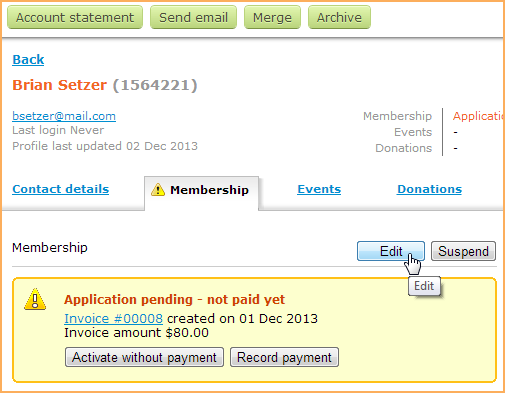 Once you are done editing, click on Save to display the Update invoice details screen. On the Update invoice screen, the line items listed on the invoice will have been updated to reflect the changes you made on the previous screen. You can change the line items manually on this screen but this will lead to discrepancies between transactions and invoices and is therefore not recommended. 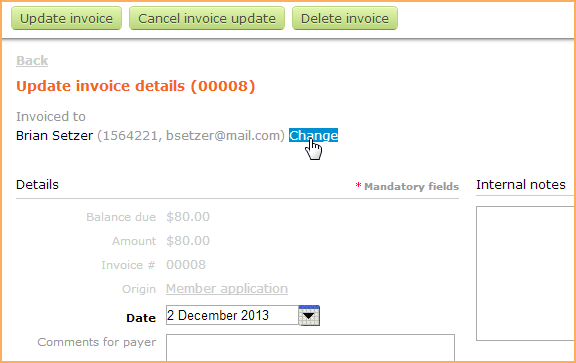 To assign the invoice to a different contact, click the Change link beside the contact's details. Click on Update invoice to save the changes and update the contact's balance. You can then print or email the updated invoice. Changing the transaction will create a record in your audit log showing the contact affected, the date, the invoice number, and the amount of the updated invoice. Changing the transaction will also affect your income report, updating your numbers to reflect the new invoice amount. 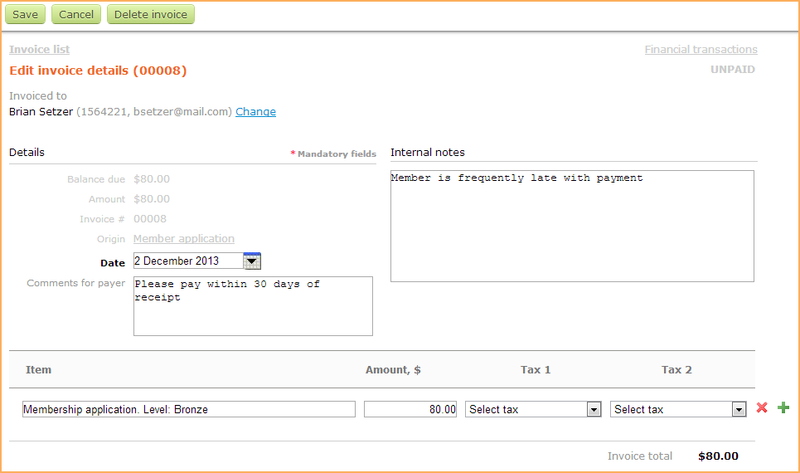 Instead of updating the original transaction, you can edit an invoice directly. You cannot change the person being invoiced if the invoice has already been paid. Editing an invoice directly (without updating the transaction) is only recommended for manual invoices. If you edit the invoice that has a corresponding transaction and do not update that transaction as well, the transaction amount might not be equal to the invoice amount. On the Edit invoice screen, you can change the person assigned the invoice (for unpaid invoices only), or update the items and amounts listed on the invoice. You can also add additional options by clicking on the green plus sign next to the last item and entering the new item name and cost into the box that appears. The cost can be a negative number if you want to include a discount. To remove an item, click on the red X. The total about due will be automatically recalculated and displayed below. Click on Save to save the changes and update the contact's balance. You can then print or email the updated invoice. If you want to cancel an invoice, you can void it. Voiding an invoice cancels the invoice without deleting it, thereby preserving historical information for any future audits. When you void an invoice, any settled payments will be removed, and the corresponding payment will be unsettled. Any event registration or membership application associated with the invoice will not be deleted, but will now appear as unpaid. Notes will be added in both cases indicating that the invoice was voided. 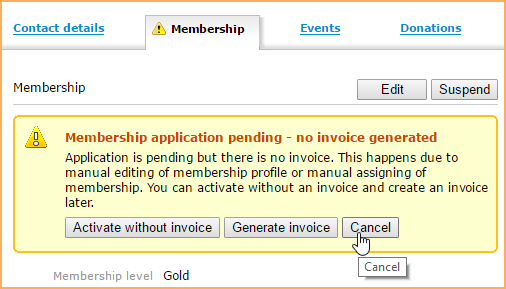 When you cancel an event registration, the corresponding invoice will be automatically voided. 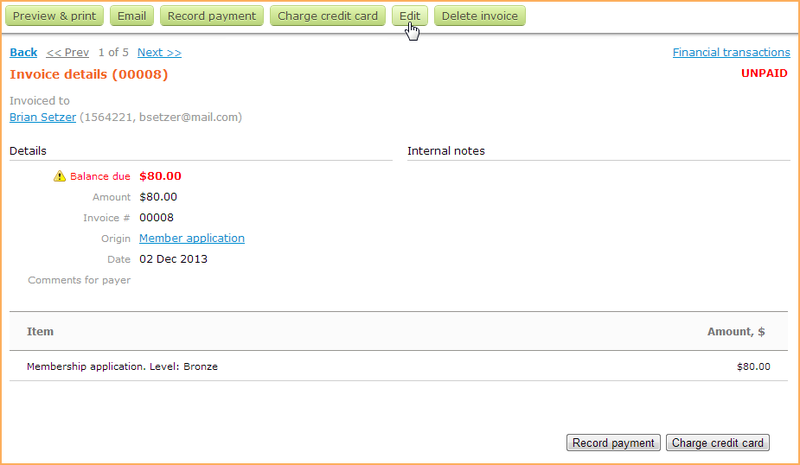 To manually void an invoice, you display the invoice details then click the Void invoice button. You will be prompted to confirm the operation, which cannot be undone. When you void an invoice, the invoice amount will not be changed but the invoice balance will be set to zero. 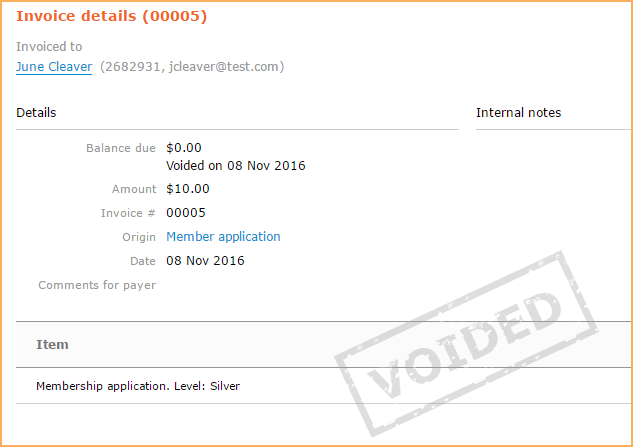 The voided invoice will have a status of voided and will appear marked with a VOIDED stamp. When you void the invoice for a membership application, renewal or level change, an option will appear on that contact's Membership tab to cancel their application, renewal, or level change. Invoices for event registrations will be automatically voided if the payment method for the event was set to Online only, and the Automatically cancel registration if payment not received within 15 minutes option is enabled, and payment is not completed within 15 minutes. Voided invoices are not included in financial reports. A record of how and when an invoice was voided will appear in the audit log. If you want to cancel an invoice without preserving any historical record of the invoice, you can delete it after you've voided it. If you delete an event or an event registration, the corresponding invoice(s) will be automatically deleted. if you delete a contact, all invoices assigned to the contact will be automatically deleted. To manually delete a voided invoice, display the invoice details and click the Delete invoice button. You will be asked to confirm the operation, which cannot be undone. Deleted invoices cannot be restored. Once you confirm the deletion, a record of the deletion will be added to the audit log showing the contact affected, the date, the invoice number, the amount of the invoice, and the name of the administrator who deleted it. Deleting the invoice will remove the invoice amount from your income report. If you delete an automatically generated invoice, it will result in a transaction with no corresponding invoice.